This rubber stamp set contains 9 images which include a variety of poppies, poppy seedheads and some silhouette corners. These lend themselves to all colour mediums - watercolour, paint, pencils, markers pens, colour wash. Suitable for many occasions. I have always loved Chocolate Baroque stamps as the quality is great and they always stamp perfectly. This set is not only a beautiful design but also up to their usual high standard and great value. 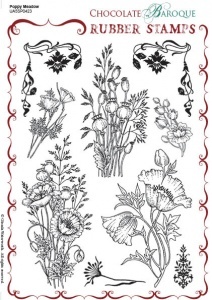 As well as the large sprays of poppies there are also several small images that are just as gorgeous and detailed. The stamp is awesome. Very high quality. 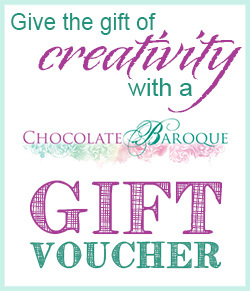 I buy stamps from Chocolate Baroque all of the time!!!!! 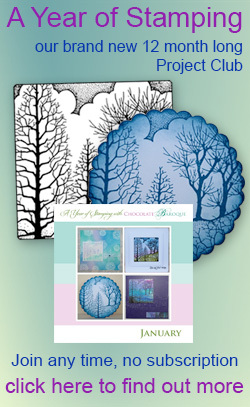 Love these stamps - have used them as a focal point and background design with great effect. The designs have a very unique style to them that helps me to be more adventurous with colour. I've used the poppy meadow stamps to make cards for charities, in a variety of media. At this time of the year I cannot make them quickly enough. Fantastic versatile stamps suitable for male and female cards. Useful for a variety of occasions. I love the flowers but the seed heads and grasses are fabulous.